For a very long time, I knew of the cc65 6502 cross-compiler for modern platforms, like Linux. 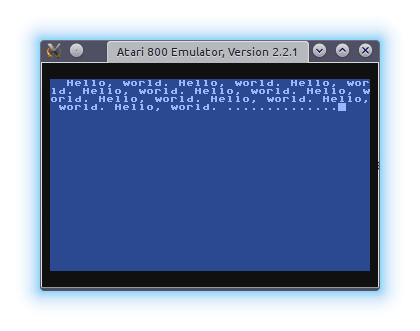 (In fact, it began its life in the 1980s as a compiler that ran on the Atari 8-bit.) I also know that people occasionally use it (often with some assembly language thrown in) to do some awesome stuff, like His Dark Majesty. Uses XXD to replace the first 3 sectors (384 bytes) of this new disk images with those 'stolen' from a bootable, single-density MyDOS 4.53/3 disk image. A disk image was created and formatted with Franny, then I used Atari800, booted into an existing MyDOS 4.53/3 disk image, to write the DOS files to the disk image. Finally, I used XXD's "-l" option to grab a hex-dump of the first 3 sectors of that bootable disk and stick it into a text file.